On Tuesday 25th October all staff and students gathered in the stadium as the Year 12 class of 2011 were presented at their final assembly. A large number of parents and family members attended the celebration and it would have to be said that it was a most joyous occasion. The students were all excited and filled with enthusiasm as they walked down the centre aisle to receive their congratulations from our Principal, Mr. Bernard Neal and the Year 12 Co-ordinator, Ms Carly Bilke. The assembly was led by Mr. Paul Carson and our new student leaders for 2012 in Mary Paino and Nathan Whinray. 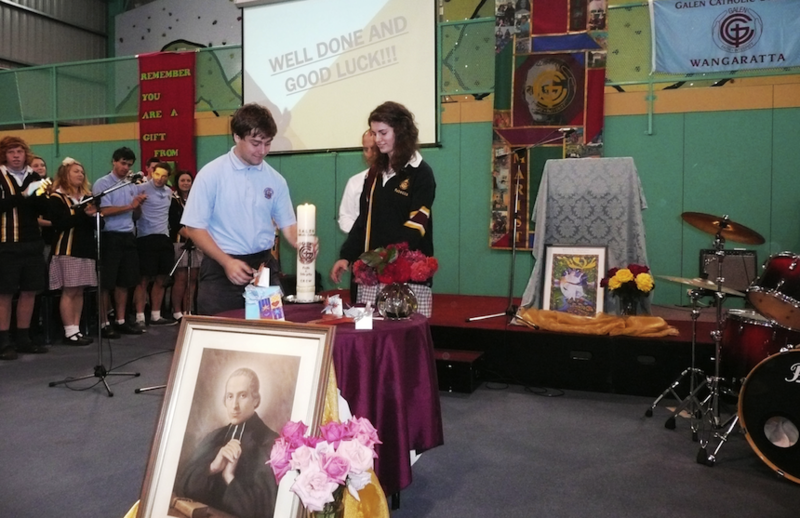 Each student received a gift from the school as a momento of their time at Galen Catholic College and the gift box became symbolic throughout the prayer as we reminded the students that they too are a gift and as they go out into the world they should share their gifts and talents with others. …Today, we celebrate and give thanks for these wonderful students and for the contributions they have made to Galen in their years here. Today, no doubt, they will remember the funny times, the serious times, the difficult times and the times of great celebration. We give thanks and praise for all this and we pray for these young men and women as they embark on a new and exciting stage of their lives….